If you are looking for professional domain and web hosting solutions, prompt service and a friendly team of experts, then Globex is your answer. You can also phone us directly during office hours at 086 722 2835 or 082 858 7389 to discuss your requirements. Option 1 : If you own an existing domain name (eg. 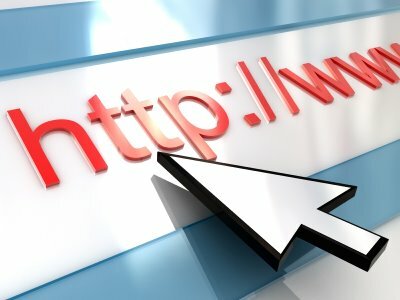 www.yourbusinessname.co.za), then Globex will transfer your domain to our server totally FREE of charge! Option 2 : If you do not have a domain name, Globex will register the domain name of your choice if it is available. 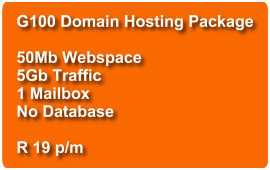 The once-off cost is R200.00 (incl 14% VAT) per domain. 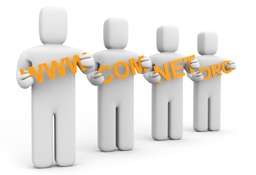 Choosing a domain name is a major step for any individual or organization. New domain name extensions and creative thinking still offer thousands of excellent domain names! When choosing a name, it is important to consider the purpose of a domain name, which is to provide an easy way to reach your web site. Short – People don't like to type! A short domain name is easier to type, read, and remember. Meaningful – A short domain is nothing without meaning, 34i4nh.com is not easy to enter or to remember. Select a domain that relates to your site in a way that people will understand. Clear – Clarity is important when selecting a domain name. Avoid a name that is difficult to spell or pronounce. Exposure – Names that are short and easy to remember are an asset. In addition to visitors, also consider search engines. Search engines index your site and rank it for relevance against terms people search for. In order to maximize your sites exposure, consider including a relevant search term in your domain. Of course, only consider this if it still maintains a short, clear and meaningful domain name.